This is the second time I’ve gone up to Tahoe during the week. I woke up at 5- my adorable alarm clock (cat) did that magic- and picked up a ZipCar, turned on NPR, and then drove about 2 1/2 hours up to Donner Pass. Ski for 4 hours, drive home. Ta-da. The result is a new outlook on life and complete aura of happiness. I went once when I was 7 or so with my sisters and mom, and it was more about falling down in the snow and giggling than actually skiing anywhere. This was a free activity as my mom had bartered some advertising space in her magazine for a stay at Strawberry Lodge, I think. I went with some friends in the dot-com time, and wore ill-fitting boots, on highly technical trails (lots of hills and turns, up a mountain side). I remember crying unconsoleably a lot, having a rotten time, and yet as we drove away, I saw the trail system pictured above, and told a friend sitting next to me, “I want to come back and ski there” to her totally bewildered stare. Fast forward many years and I decide to go up for a few days and stay at this really nice hotel. I was a basket case. I bought my own skis (… yes, having never enjoyed skiing I bought some skis. Remember, it’s about “being a person” not “trying an activity,” haha). I snowshoed into the summit area – you can’t get there unless by driving, and a quick trip in a rental car made me realize driving in conditions freaks me out. 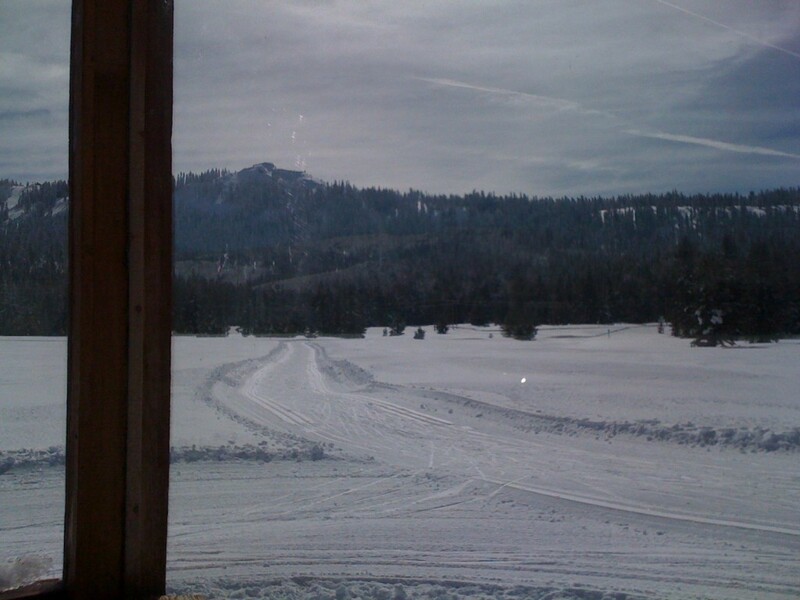 So I snowshoe’d into the lodge and took a ski lesson. I ski’ed all day. Up and down this tiny trail called Big Ben. My friends joined me, and like normal poeple they snapped on their skis and shot down the hill, falling down every 40 feet but loving it. I ran across one of them at the end of Big Ben, at this big hill called Rodney’s Run, and she was practicing snowplow. I was still barely walking and shuffling in skis. OK at this point you may be thinking “Anna has some class issues- this is all about appearing wealthy,” but the reality is, I really like being out there. It’s meditative. You’re doing this cardio sport in this beautiful atmosphere, and you’re exploring. I love coming across animal tracks in the snow. It’s so clean and clear, and breathing the air just feels good (oxygen deprivation? haha). So a few years later I’ve been going up every season and slowly getting better. Yesterday I tried snowplow again and magically my body got it, or my head, or something. It just made sense. I slowed down and had a modicum of control. I started down one of these trails that always scares me – Yuba – that has a relatively steep descent, and was in control for about 1/2 of it, until Ice and not getting out of the tracks (to do a proper snowplow you have to get out of the groomed track) and a long descent, and I was out of control and going fast, so I sat down on my skis and fell over. And then 6 people slowly skied by, uphill, and asked how I was, etc. very politely. Ah, humiliation. It was OK. I ended up getting helped by a woman who later on I would help when she fell on ice in the parking lot. In two weeks I go up again with a bunch of friends, and hope to take a lesson in skating, which really seems like ufn, oh, and ski down one of the big trails I haven’t done yet, and snowshoe up to the top of the ridge so I can actually see the royal gorge. Written Friday, January 29th, 2010 in fitness. You can leave a response, or trackback from your own site. Hey if you come to montreal come along we're going to skate a little bit. There's that huge resort there, have you been?